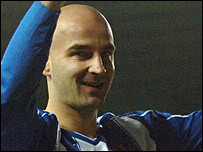 Substitute Antoine Sibierski hit an 82nd-minute winner to give Wigan their first away victory of the season. Bottom club Derby, who gave debuts to Robbie Savage, Hossam Ghaly, Emanuel Villa and Laurent Robert, had Claude Davis sent off in the second half. Defender Davis was dismissed for a second booking following an aerial challenge on Marcus Bent. Antonio Valencia missed a great chance for Wigan before Bent headed down for Sibierski to lash home from 25 yards. The result - Derby's seventh consecutive home defeat - was a bitter disappointment for the struggling Rams after their midweek forays into the transfer market. Argentine striker Villa worked hard but had a tough introduction to English football and was replaced by former Wigan man Gary Teale in the second half. Robert, meanwhile, had an ineffective first outing for Paul Jewell's side. What did you make of Derby's new signings? Boss Jewell, up against his former club, handed Savage the captain's armband following the Welshman's arrival from Blackburn and the sale of ex-skipper Matt Oakley to Leicester City. Savage was clearly determined to make an impact and was warned by referee Mark Clattenburg after a crunching early challenge on Emile Heskey. But Wigan, who gave a debut to Honduran midfielder Wilson Palacios, looked the better side during a poor first half and Bent should have put them ahead. Valencia found space on the right, collected Heskey's flick-on and hooked the ball into the penalty area, where Bent blazed over from 10 yards out. A poor clearance by Savage almost led to Wigan scoring 12 minutes before half-time. His weak volleyed clearance fell to Michael Brown, whose 20-yard shot had to be pushed away by Derby goalkeeper Lewis Price. Heskey pounced on the rebound and passed to Bent, who tapped into an empty net but was clearly offside. Derby reached the interval on level terms courtesy of a terrible miss by Valencia. The Ecuador midfielder fired the loose ball wide of the target after Mills had cleared Bent's shot off the line. Wigan continued to press after the break and went close when Bent's long-range shot flew just wide. The Latics were handed a great chance to end their winless away run when Derby were reduced to 10 men after Davis clumsily barged into Bent with his arm. Jewell responded by replacing Robert with the more defensive Marc Edworthy. But it was Wigan manager Steve Bruce's substitution that proved decisive. He sent on Sibierski with the Latics struggling to make their numerical advantage count. And the Frenchman responded by finding bottom corner of the net, giving Wigan a potentially vital win in the battle against relegation. "It looked like one goal was going to decide it - and I could never see us scoring. "We tried manfully but we're not bottom because we're unlucky. It's because we're not good enough, and that's a fact. "We've got to be bigger and stronger, and the players who are here have got to be better." "By half-time we should have been out of sight. We had two or three great opportunities. "The second half was a dull affair. We were perhaps better against 10 men, but then Sibierski came up with the goal. "Paul Jewell reshuffled things after the sending-off and made it difficult for us. Our real chances were in the first half." 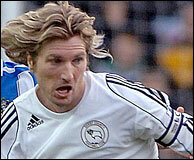 Derby: Price, Mears, Davis, Todd, Mills, Fagan, Savage, Ghaly (Macken 85), Robert (Edworthy 59), Villa (Teale 71), Barnes. Subs Not Used: Hinchliffe, Lewis. Wigan: Kirkland, Melchiot, Bramble, Boyce, Kilbane, Valencia, Brown, Palacios (Koumas 64), Landzaat (Sibierski 81), Heskey, Bent (Olembe 90). Subs Not Used: Pollitt, Aghahowa. BBC Sport Player Rater man of the match: Wigan's Jason Koumas 7.00 (on 90 minutes).